A golden heart stopped beating. Hard working paws laid to rest. God broke our heart to prove to us, that he only takes the best! Toni Casier & Raven were more than just my good friends. Toni taught me everything about training obedience and competing. Bo was truely the best dog to start out with. He loved to entertain even in the obedience ring. He also was major ptd in ASCA, but never finished. He produced my first BBX Champion. 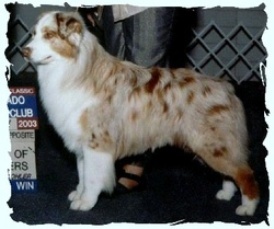 His registered name was Something Bodacious Buffington CDX (ASCA/AKC) Cgc. Although below Blu's life was cut short. He was the nicest example of what this breed should be. We miss you little buddy! 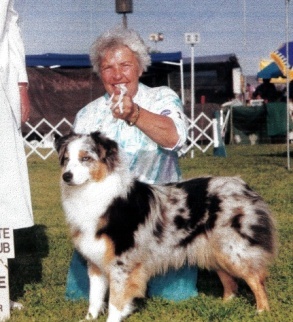 Ladd was the funniest dog to show both in the obedience ring and the conformation ring. But his love was the conformation ring when the crowds cheered him on. 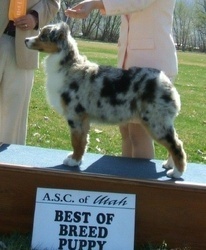 At the time of his death he had 9 single points with one 4 point mjr and several group placements in AKC. 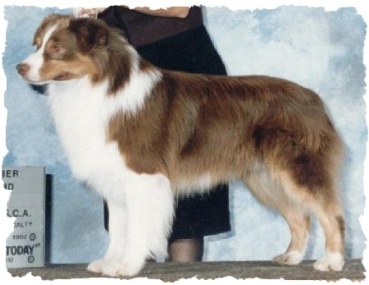 This beautiful red tri dog was my dad's first champion. ASCA Ch. The Ultimate Warrior Of StoneRidge also known as Warrior. He was a champion producer, but best of all he was a great companion and a great dog to have around. 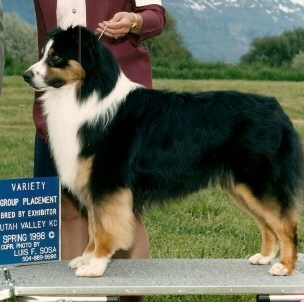 His breeders were Cherrie Cannon, Marge Tripp of StoneRidge Aussies, in SLC., Utah. Dutch to the left here was one of the only living sons of Chance in 2011. "WTCH CH. Gold Nuggets Contender CD HOF and HOF Spring Fever's Jazzmin (VCH Ch WTCH Gitalongs Half Cocked and WTCH Ch. Spring Fever's Contessa.)" He never met a person he didn't like. Hips: Good, Eyes: Cleared May 2011. The best temperament in the world. This is the only photo I have of him now. I loved, owned and showed him for over 6 years. He was a hoot to have around. 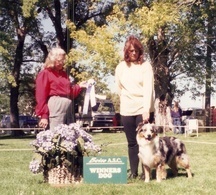 Owner/Breeder was Julie Rogers of Glendale, Utah. Dutch passed over the Rainbow Bridge, July 2011 may you rest in peace. Dutch has produced well and does have finished get. And has also produce dogs that have gone into helping those with some special needs. I wanted to thank Julie for sharing this beautiful and sweet boy with me. I will never forget him! ASCA CH. Dazzles Go AHead Make My Day aka Tanner or Tanny . Tanner came to me at the age of five months old. He was a scared little man and never really got over that. At just 13 months old he got his first 5 pt major. He was run upon my another handler and was scared again. Some people will win at any cost. It took me the next five years to finish him. It was a lot of hard work but so worth it to me. I only bred him one time and got my beautiful Cassye. However she had her fathers scared temperament. And I just couldn't go through that again. So I neutered him and spayed her. I lost my sweet Tanny at the age of 8 to cancer in June 2014. I miss my big boy every day and so does Addy. After a mysterious illness, that the specialists couldn't treat or figure out. I decided to put my bright and beautiful boy to rest. I couldn't watch him suffer. This broke my heart and I know there will never be another one like him. Rest in Peace Teller, mama loves you sweet boy and will miss you so much. Teller was only 21 months old! All pictures on this site are my property and may not be used elsewhere. Without my permission!